Bernadette Sanders recently decided to move her company, Quilting Around the Corner, from her home to 13 Access Highway, the former site of Friendly Redemption. LIMESTONE, Maine — Bernadette Sanders recently decided to move her company, Quilting Around the Corner, from her home to 13 Access Highway, the former site of Friendly Redemption. The location gives her the opportunity to do a number of things that she has been waiting for the right time to do, Sanders said via a press release from the Limestone Chamber of Commerce. Sanders is originally from Ohio where she owned a business named Quilting on the Corner, which fit perfectly because she shared a four-way intersection with a bank, a gas station and a church; hence the name. She is self taught and has been quilting for over 30 years, during which time she has made over 500 quilts. Many of the quilts she has made have been used as fundraisers, including one she made for the Limestone Chamber of Commerce back in 2015. She and her “Quilting Lady” partners not only made the July 4 quilt, they sold $1,700 worth of raffle tickets and donated the proceeds to the Limestone Chamber of Commerce. Sanders told the chamber that Quilting Around the Corner is the only place in Aroostook County with 10 sewing machines available for use on site on a rental basis, but their primary use is in classes taught at the store. She stated lots of folks are worried about whether they can make their fabric cuts properly and they can learn how at the shop. Quilting fans can also join the Limestone Piecemakers Quilting Guild, which meets monthly at the store. The Guild offers a place for quilting lovers to socialize, share their skills and also learn from others while they get a free lesson each month. The guild also makes some of the quilts that are donated as fundraisers to worthy causes. Customers can choose from over 100 quilts in stock, have one custom made or work with Sanders on a design, according to the press release. Sanders creates her own designs and also makes quilts for retailers to promote fabrics. The chamber stated that the shop sells notions, but not fabric. 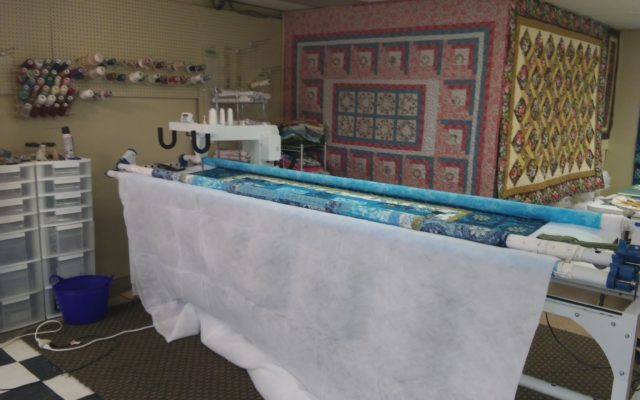 For large jobs, Quilting Around the Corner has a long-arm quilting machine that allows quilts up to 108 inches. In the near future, Quilting Around the Corner will allow local crafters to sell items on consignment and will host community quilt shows. Sanders lives in Limestone with her 8-year-old blue/gold macaw, Romeo, who keeps her entertained with his large vocabulary. For more information call 498 9259 between 10 a.m. and 4 p.m. Monday through Saturday, or visit Quilting Around the Corner on Facebook.